Now you see I just had to look didn't I! Great progress on your WIP. your WIP is looking wonderful! I need to run out and grab this for myself. It looks great! And those new designs are fantastic! Yes you are right, the new designs of Dianne are really sweet! HN2 is looks fab! I like then new designs too! Esp. Embroidery Guild. I think I might have to get that one! I was thinking of starting the Thread Gathering, but seeing how lovely your Home of a Needleworker, too, is coming, I might have to start that one. Love the new Quilting design Diane is bringing out. Its really cute. Glad the boys are feeling better. I wish my Crescent Colours would come soon - I want to start this one! I just ordered this chart from DSL with the threadpack and it was mailed to me yesterday. I can't wait to get it! I also ordered the new LHN designs AND subscribed to the new Threadpacks. I am in BIG trouble! LOL! Wow this is looking lovely Nicole! You're stitching it up so fast! 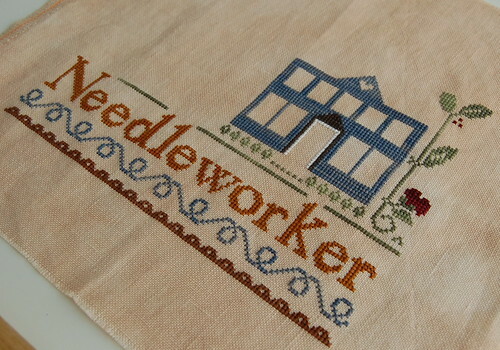 I love the look of Home Of A Needleworker (Too), and as always your photo does it justice. Thanks for your comments on my blog. I will email you over the weekend to talk stitching. :) Glad Matthew's feeling better too! Your progress is looking great. I love this design too and hope to buy it one day.